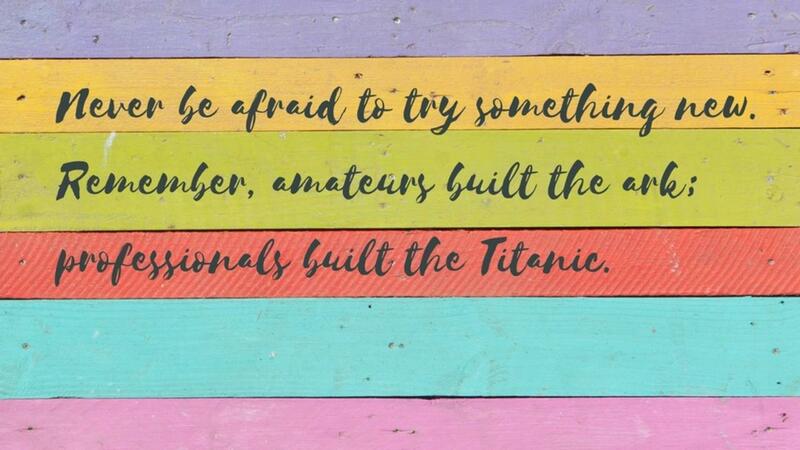 I posted this anonymous quote on social media today, “Never be afraid to try something new. Remember, amateurs built the ark; professionals built the Titanic”. I posted it as much for myself, as for anyone else that needs the reminder. When feeling stuck, when things aren’t going as you’d hoped they would, change it up. Do something different and don't give up! Start by thinking about your “why.” We all have one, and it’s personal to us as individuals. Your why is the primary reason, purpose, and/or goal that motivates you in your life, and in your business or work. It could be money, love, family, name recognition, or helping others. Your “why” is the driver behind your motivation every day. When challenges arise, we rely on our purpose or our passion for pushing us through the inertia or disappointment. So, what matters to you? What makes you feel excited or passionate? This will be the motivator to help you through the rough spots –those feelings of discomfort, or when you're fearful of trying something new, stepping out of your comfort zone. In my world, every step of building the Relationship Protocol ‘s business has been challenging or new for me; no exaggeration, ALL of it was NEW for me –from writing and publishing my book, The Relationship Protocol, to doing webinars, giving talks and being on social media. I often felt out of my league, uncomfortable and confused. I didn’t know anything about writing, publishing, social media, marketing, or the technology associated with every aspect of having an online presence. I also consider myself to be a private person, and in truth, when I started this process, my big plan was to write something about my work with relationships, make it an anonymous download and have it go viral. Boy was I mistaken and naive! What did I know??? I’m a social worker/psychotherapist who has worked with struggling relationships in my private practice for over 25 years. My peers consider me to be a relationship expert and this is how I defined myself career-wise. I love my work and have had a wonderful, comfortable and satisfying professional career. Yet, once I decided to share my work, my way of teaching others how to have better relationships and how to talk to each other; I started feeling uncomfortable and exposed. Why did I set myself up to be in challenging situations, one after the other? I could have stayed in my lane, continue my practice and shortened my waiting list. But… it was my why that kept me going and motivated every day. My desire to reach more people and help them to have more satisfying relationships, become more confident communicators and learn how to deal with conflicts outside of the four walls of my office… is my driver. This sense of purpose gave me the push I needed to complete my book, join social media, be vulnerable (in my mind) and talk about things publicly that are important to me. And every time I hit another bump in the road, I prompt myself. I remind myself of this motivator, my driver and the impact I can have as the Relationship Protocol reaches more and more people. I'm grateful that I can help others to have better relationships. That's my purpose. My why. - I hit the refresh button. If I didn’t have my why, I would have given up many times over in the last few years, and with good reason. Even today, a few years later, I still get stressed marketing the Relationship Protocol book and trying to connect with people in a real way, without sounding salesy. I struggle because I care about my reputation. I also fall back into being that private person, who needs to be reminded of why I am committed to this journey. So, how about it? Try something new, try something different. Find your why and then step through the fear! I know you’ll be glad you did. I am! !